Martin Truex Jr., winless at tracks less than a mile in length, was fastest in opening and final practices at Martinsville Speedway. He ran the south Virginia short-track in 19.776 seconds, 0.022 seconds faster than Brad Keselowski. Opening practice for the Monster Energy NASCAR Cup Series began five minutes past 10 a.m; with a snowstorm looming behind the blue ridge mountains, teams had extra urgency to learn how their car would unload off the hauler on an already condensed schedule weekend. Temperatures hovered above the freezing point during the first practice before warming briefly to forty degrees. Though the conditions are unique teams can still gather useful data, considering temperatures for tomorrow’s running of the STP 500 will remain in the 30’s until late afternoon. Kevin Harvick, already a winner of three straight races this season was 15th fastest in opening practice and 25th during happy hour. Photo by Jonathan McCoy. The winner of Martinsville Speedways fall’s race, Kyle Busch was third and fourth in the first and final practices. 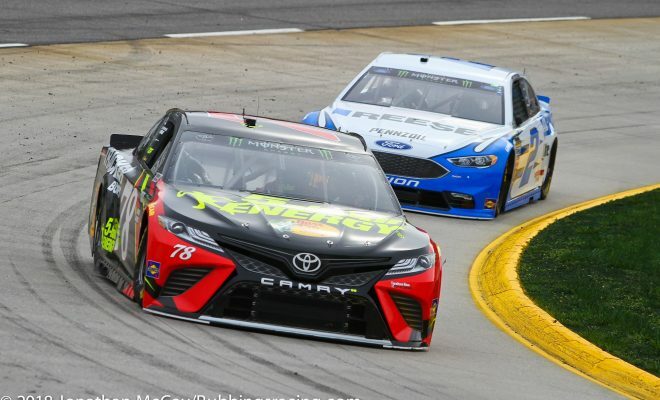 While he fell a spot on the single lap speed charts to his Joe Gibbs Racing teammate, Daniel Suarez, Busch held the fastest 20-lap average — 20.14 seconds. This was two hundredths of a second faster than Ryan Newman and Clint Bowyer’s average lap times of 20.18 seconds. Notably, Truex was tied for fifth in this grouping and Keselowski was tenth, a full tenth of a second behind Busch’s time. Because Keselowski was first under the 10 lap average it’s safe to speculate the No. 2 Team Penske Ford will be a short run car Sunday afternoon. Jimmie Johnson, a nine time winner at NASCAR’s shortest speedway, was 28th in happy hour — the slowest of the four Hendrick Motorsports cars. The entirety of Roush Fenway Racing, JTG Daugherty Racing, Richard Petty Motorsports, Germain Racing, Team Penske, JGR, Furniture Row Racing, and Richard Childress Racing all ran faster than the seven time champion. What’s probably the most disconcerting for crew chief, Chad Knaus, is the team’s 27th position on the 10-lap average speed-chart. 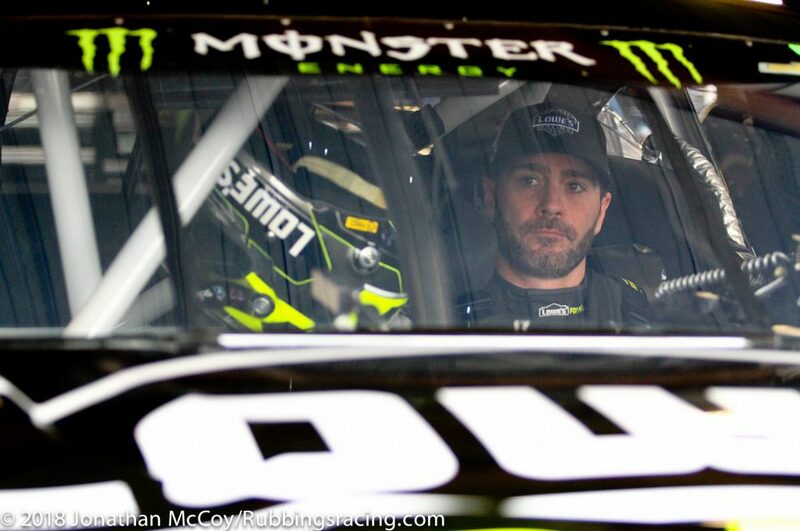 Johnson looks out the windshield of his 2017 Chevy Camaro ZL1 during morning practice. 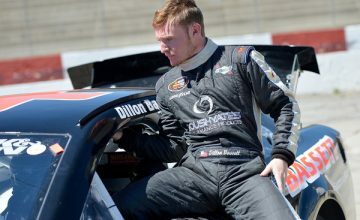 Johnson last won at Martinsville Speedway in the 2016 fall race, but over the last seven races he has finished outside of the top-10 five times and beyond the top-30 twice. Photo by Jonathan McCoy. During happy hour, Ricky Stenhouse Jr. pancaked the right side of his No. 17 Fastenal Ford in turn-four. His RFR team has taken out a backup car, because of new sealed engine rules for 2018 the team will have to install an engine into the secondary car — likely the motor from the wrecked vehicle. 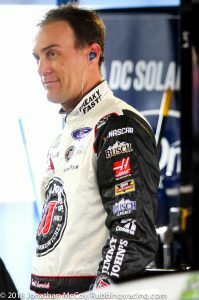 Stewart Hass Racing put two cars in the top-10 in fastest single lap speeds, but those same drivers Aric Almirola (seventh) and Bowyer (10th) were among the top-five in 10-lap averages; under that average Bowyer was fourth fastest and Almirola fifth. The freezing rain that had been crawling across Virginia’s Piedmont region reached Martinsville Speedway shortly after 2 p.m.. The precipitation stopped the Camping World Truck Series race, the Alpha Energy Solutions 250 shortly after it began. Three to five inches of snow are forecasted through the night so NASCAR elected to cancel the rest of Saturday’s events once the weather arrived. With qualifying canceled NASCAR will set the starting order per the rule book, the team owner point standings. Truex will roll off first with Busch alongside, behind the front row will be the Team Penske trio of Joey Logano, third, Keselowski, fourth, and Ryan Blaney fifth. 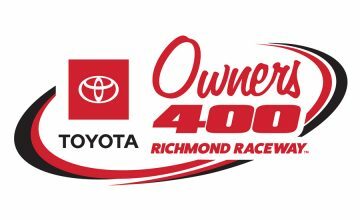 Denny Hamlin will start on the outside of the third row in sixth, Kyle Larson will start seventh, and another triad of teammates, Harvick, Bowyer, and Almirola round out the top-10. DJ Kenington and JJ Yeley will start in the last row, taking up two of the possible four open spots. Thirty-eight cars will start the STP 500 at 2 p.m. Sunday.